Shelves, custom furniture, benches, cupboards. 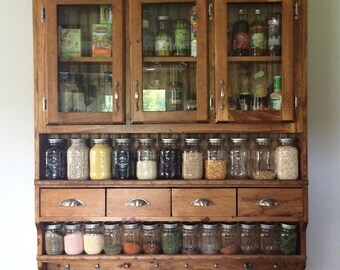 Custom Spice Pantry, Spice Rack, Collectors display with drawers. Announcement Welcome to Eugenie Woodcraft. I design and build, hand-carved, hand made, romantic pine furniture. Shelves, tea cup shelves, cupboards, tables, benches, coat racks, chests, coffee tables, clocks, mirrors, brackets, gables, magazine racks, cradles and more. You're sure to find something for all your decorating needs. My wood crafts are carved with Roses, Robins. or a geometric Sunset design. I also offer some custom designs. Every piece is well made, hand finished and unique. Please note that I do not keep everything in stock because I hand make, carve, and finish each item as it is ordered. Delivery takes up to 6-8 weeks. I also sell my simple woodworking plans on www.etsy.com/EugenieWoodPlans. Welcome to Eugenie Woodcraft. I design and build, hand-carved, hand made, romantic pine furniture. 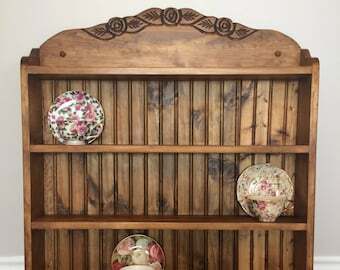 Shelves, tea cup shelves, cupboards, tables, benches, coat racks, chests, coffee tables, clocks, mirrors, brackets, gables, magazine racks, cradles and more. Replacement cupboard doors, cabinet doors, kitchen or bathroom. 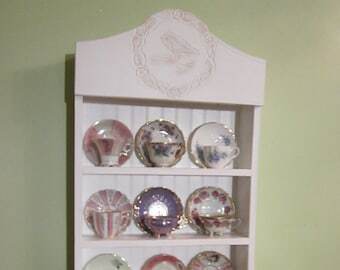 Tea cup shelf, 12 cups with drawers. Drop down table for small spaces. Rose carved harvest or entry table. 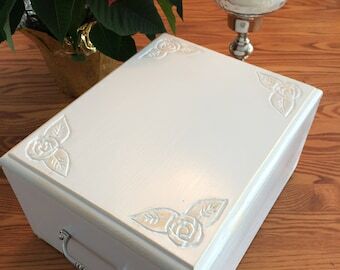 Momory box, letter box, keepsake box, secret box. memory box, small chest, storage box. I never received this item. I LOOK every day for it to be delivered, waiting excitedly for this for a month but have not received it! WHERE IS IT??? You gave me just three weeks to design, cut, carve, build and put the finnish on the shelf that I told you would take 6 to 8 weeks. I sent you out a beautiful shelf on the 5th week. The review section of ETSY is suppose to be a review of the product, it is not a regular e-mail or method to get information. I don't appreciate getting a bad review because you were impatient. I put alot of effort in my furniture, and do my best to make my clients happy. Adorable little stool that matched my other whale decor. It was made quickly, shipped quickly/safely and it is sturdy, quality work. Thank you! Eugenie was a delight to work with; the well-packed shelves arrived when promised; the construction is solid, handsome, and fits the space perfectly! This is my shop. The table in the front is where I carve and build my furniture. This is at an exposition in Rive Nord. This is my boutique over my shop. My furniture at a woodworking show. Eugenie perfects a simple method to build beautiful furniture. I started woodworking about 15 years ago. I wanted a few shelves, but I didn't like the traditional method of building furniture. When I started, my shop was small, and I didn't have room for a planner or large equipment, and I didn't like waiting for the glue to dry with clamps. I devised a method of woodworking that I call the glue, screw and cap method, that allows me to build furniture in a strong, fast and efficient manner. I embellish my furniture with simple motifs that I carve with a hand held rotary tool. This type of carving is faster than the traditional method of carving, and adds a unique look without slowing down the production time. I think my furniture has a timeless look and quality, relevant to todays market. I now have over 150 woodworking plans for my customers to choose from. I can reproduce any of them in the color of their choice, in a reasonable amount of time. I also sell some of my plans on www.etsy.com/shop/EugenieWoodPlans. I design the plans, carve and build the furniture, and apply the finishing. Cherie Gosselin is responsible for shipping, packaging , and accounting. Hello, I am the woodcraftqueen. I have been making furniture for over 10 years. All my furniture is made using a glue, screw, and cap method, which is both attractive and strong. It is then carefully sanded, stained, and three coats of polyurethane are applied for protection. I make all my own patterns, so my furniture is unique.